This is the ultimate vacation for those of you who love thrilling rides and taking to the slopes! Once you arrive in Eureka, you'll instantly feel the small hometown feel of this little railroad stop on Route 66! So get your family and friends together for a vacation that you will remember for years to come! We'll provide the place to sleep, cook, and relax. All you need is yourself, food, and clothes, of course. Experience the beautiful parks and outdoor events St. Louis County has to offer and wonderful people who live here, and I'll know you'll be coming back for more! I'm a native to St. Louis. I have been a Vacation Hostess for 8 years now and love what I do:-) I began renting out my 4b/4b condo at The Lake of The Ozarks and now rent out the rest of my properties and manage a few others, (4 Villas, a few homes in and near St. Louis, 2 Condos at the Lake, and Frank Lloyd Wright inspired home on 55 acres with pool and lake), since the loss of my husband, 8 years ago. I have 2 beautiful children, a wonderful son in law, and three darling grandchildren:-) I LOVE what I do and enjoy the hospitality business:-) Thank you for checking out my properties:-) I sincerely appreciate your business! 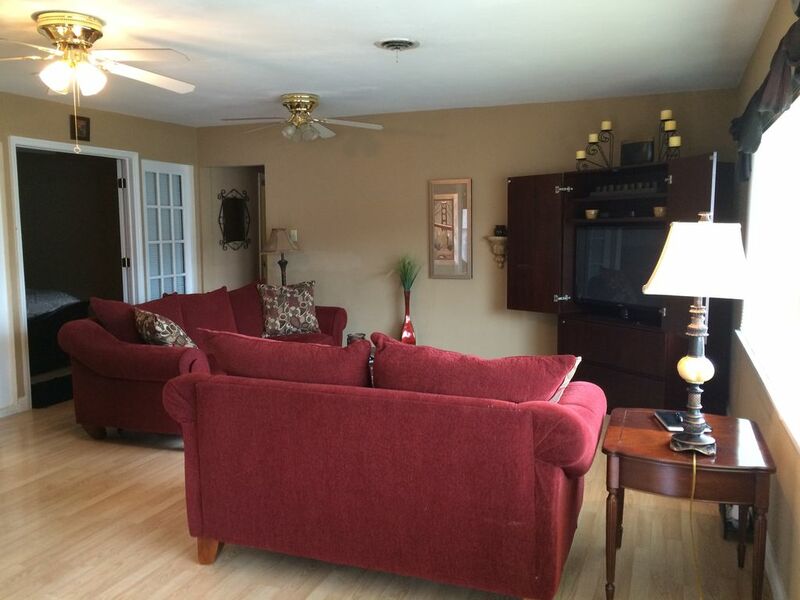 This property is close, within 15-30 minutes, to all the St. Louis attractions! It is in a very safe neighborhood and semi-private due to this is a building that has only 4 Villas and sits on 1.3 acres. You will love the location of this property for ease of getting anywhere in St. Louis quickly, as it sits just 1 block off intrastate 44. One bathroom with a seated shower, single sink, and toilet. The Villa is in a very convenient location. The unit fit our needs as far as size goes but the place needs a little touching up. A good cleaning is needed-carpets cleaned, walls scrubbed, walls patched. We arrived to 1/3 roll of toilet paper with no replacements, no paper towels or napkins, no cookie sheets and only 8 forks for a 5 bedroom place. There was also no trash can in the bathroom which seemed a bit odd. These are fairly minor things and very fixable in my opinion. There also needs to be a more secure lock between units. We were able to go into the next unit with the turn of a knob. So, the place was ok for one night but we did have to make a trip to the store to buy toiletries, paper products and cookie sheets for our family get together which was a bit frustrating. I wouldn't let animals sleep here let alone my family. Donna home was pretty awesome. She is a great host. Her home was conveniently located to everything and had plenty of space for my family. Excellent Surprise Party Get Away! The property was just as I expected. Everything was in order when we arrived after an 11 hr drive cross country. There was plenty of sleeping accommodations for our group, and great spacing for our surprise 50th birthday party. My Sister was TOTALLY surprised. The property owner, Donna, was very personable, yet professional! I was so pleased/impressed, that I introduced her to our party invitees! We had a wonderful time and couldn't have asked for a better place to host our event. I highly recommend that vacationers contact Donna before you consider other properties/property owners! I loved the fact that there was a Walmart, Chick Fil A, grocery store and other restaurants/businesses nearby. This made last minute event shopping very convenient! Awesome experience! Dona was super nice and very helpful with everything. She was very easy to contact and replied instantly. The home was marvelous and very accommodating. I would definitely recommend this! 5 stars from us! We came from 10 hours away and arrived in the evening after a long drive in rain. Everything was in readiness and just as described. Great communication! 5 bedrooms! We had room to be together or have privacy. There were a few heat issues, but Donna got on them right away, had them fixed promptly and even offered us other places to stay if we wished. We like to cook together and have family time so this worked very well for us. The place fit our needs perfectly. and we'd stay there again. You will find something appealing around every turn in St. Louis. If golfing is your pleasure you will find dozens of courses. If it's the nightlife you thrive, you will find many venues playing a wide range of music to suit everyone's listening pleasure. Hidden Valley Ski Resort is 1 mile away!!! Families, we've got you covered also, take the kids to a baseball game at Busch Stadium, home of the St. Louis Cardinals, visit Six Flags St. Louis, just 1 mile east of this property, or the newly expanded St. Louis Zoo, explore the nationally recognized Magic House and then it's your turn to shop til you drop at West County Mall or The Galleria. The list goes on and on! So what are you waiting for, give me a call and make your reservation, time is slipping away for this summer season and the winter season will be booking up fast! Don't worry though, if someone reserved this villa before you did, there are 3 other villas in this building. (#7085866, 468352, 485697) I also have a beautiful luxury estate situated on 50 acres with 5 bedrooms and 3.5 bathrooms just 50 minutes from downtown St. Louis, #49416.